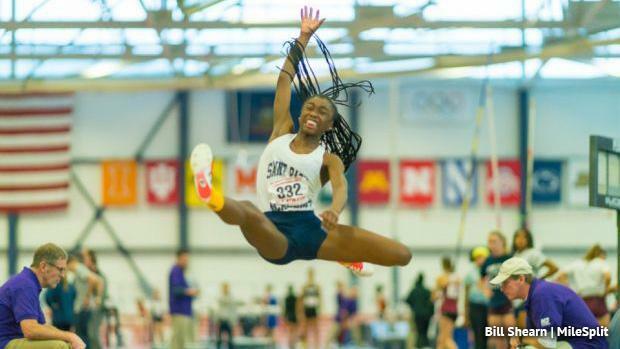 One of the state's most wide open events this season look to be the girls long jump, where a number of jumpers will be in the mix for the top spot in the state of Pennsylvania. A number of girls could hit jump in the high 19-foot range and possibly even another 20-footer. At the top of the indoor returners list is Tia Taylor of Saint Basil Academy. In a very competitive and season-best-filled indoor state meet long jump, Taylor, then a freshman, leapt 19-04.5 to take third place, just a half inch off second place and two inches off the win. Now a sophomore, Taylor will look to take the top spot. Of course, there are plenty of challengers. North Penn's Natalie Kwortnik was fifth and Perkiomen Valley's Christina Warren was sixth at indoor states last year. Both jumped season bests, like Taylor, at Penn State. Kwortnik ended up fourth in AAA at outdoor states. At districts, she jumped an impressive 19-04. Warren, a multi-time triple jump state champ, was sixth at outdoor states in AAA. The other returning indoor state medalist is Jayla Ellis of Oakland Catholic. She jumped 18-08 to take eighth at indoor states. North Allegheny's Casey Burton was ninth at indoor states, just missing out on a medal, but she responded by jumping to a big PR of 19-06 at outdoor states to place second in AAA. Burton, a junior, will definitely be one to watch this winter.